October is National Manufacturing Month and in this month dedicated to manufacturing I encourage people to learn more about manufacturing in DeWitt. I began my career in this field twenty-two years ago. My journey started with an opportunity to work part-time at a company named JRB located in DeWitt’s Industrial Park. JRB was a manufacturer of construction attachments for John Deere and other Original Equipment Manufacturer’s. At the time I had no idea where the Crossroads Business Park (DeWitt’s Industrial Park) was, what companies were located in it, nor the goods they produced. What I did recognize was an opportunity to work outside of the typical part-time high school job. Like many other high school students, I hadn’t made up my mind what I wanted to do for a career. I did know that I wasn’t looking forward to four years of college and viewed this job as a way to see what else was out there. So, I found myself in a completely new environment, where people were welding, operating lathes, burn tables, boring machines and painting. We were literally taking raw steel and processing it into loader buckets, forks, booms, and couplers. I grew to love the various processes, people and new opportunities that presented themselves. I got a deep sense of satisfaction when I saw a bucket on a Deere wheel loader that our team in DeWitt had proudly made, as a matter of fact, the bucket on the City of DeWitt’s 544 was made at the DeWitt facility. Just like any industry, construction equipment has its ups and downs. I saw plant expansion and contraction, selling and acquiring businesses, new product lines and phasing out legacy products. Through it all, I was able to turn hard work and dedication into opportunities for growth. I worked my way through different departments and increased roles of responsibility culminating in a leadership role as a plant supervisor. Unfortunately, in 2009, due to the biggest recession since the great depression, JRB was shuttered and production was moved to sister sites in other states. I was fortunate to stay on with the company that owned JRB and traveled between Davenport and Dubuque to manage a small division called CustomWorks. Then three years later in 2012 I saw an article in The Observer that a Canadian company called Black Cat Blades was purchasing the old JRB building in the Industrial Park. I stopped by the plant one day that October which led to a four month interview process where I was given the opportunity to get to know Black Cat and the culture that is very important to our business model. A large part of what attracted Black Cat to DeWitt was not just the fact that the Industrial Park was less than 20 minutes north of Deere Davenport Works or 50 minutes south of Deere Dubuque Works, it was the people from the area they were meeting which started with the DCDC and DCDC members. 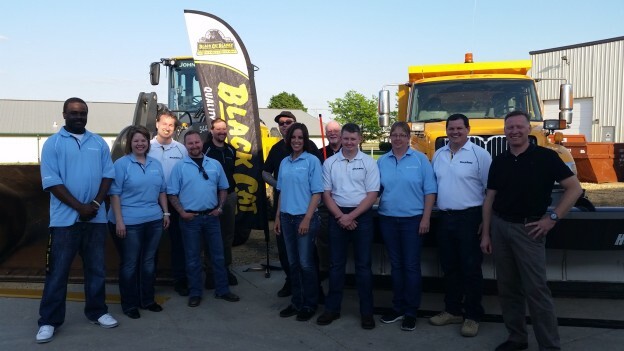 The thought has always been that the community of DeWitt was a good fit for Black Cat’s culture and guiding principles, and that continued through the use of local contractors like Jansen Electric, Holst Construction and Dorhman during start up. We believe in building relationships in the community we operate in and over the last four years I feel we have been successful in becoming part of the community. We now employee 16 team members and in 2014 we started manufacturing wear blades in addition to our warehousing activities. DeWitt is very fortunate to have a successful Industrial Park and the jobs and opportunities that exist within it. So the next time you have a few minutes take a drive through the Crossroads Business Park and you will see all kinds of different manufacturing companies making anything from air fresheners, glass, testing products, wear components, pumps and valves, and ground engaging tools. These companies come from all around the United States and other countries like Canada, Italy, and Sweden and truly demonstrate that DeWitt is part of a global economy. See more about how DeWitt Delivers manufacturing and more! This entry was posted in Community Insights, DeWitt Delivers, Look Local First and tagged Black Cat Blades, Business Development, City of DeWitt, Crossroads Business Park, DCDC, DCDC Membership, DeWitt Chamber & Development Company, DeWitt Chamber and Development Company, DeWitt Community, DeWitt Delivers, DeWitt Iowa, Holst Construction, Industrial Park, Jansen Electric on October 21, 2016 by admin. Options by the numbers. Thirteen companies offer insurance services in DeWitt which cover home, auto, life and health needs. Over ten financial institutions present a variety of services such as banking, investing, and accounting; and six of them offer tax service, which is important to note during tax season. If you are wanting to change your look, try one of the five hair salons like Touch of Bliss Salon Spa or the two barber shops in town. Four printing and signage companies like Custom Art and Signs offer many different custom services for your business or personal needs. With all those options and competitive prices, you don’t have to look out of town. Reliable problem solvers right around the corner. You don’t have to call an 800 number and be put on hold. Not only are there many options and quality service, there’s a bounty of highly trained professionals right here in DeWitt. Frustrated with spreadsheets at work? Hasenmiller Spreadsheet Solutions specializes in optimizing your time by customizing spreadsheets. Need some advice on a house addition? Consult with one of the three highly experienced construction companies, three electrical contractors or two plumbing and heating companies in town. Does your car need a tune up? Take advice from the three long-standing mechanic shops right around the corner. Three attorney offices offer legal expertise to business and individual clients, which saves a trip to larger cities when dealing with legal matters. Welcoming community equals business growth. While offering services locally, many companies stretch their territory to a large part of Midwest zip codes. Sandry Fire Supply not only provides gear and equipment to many surrounding states’ fire departments, but also provides emergency car-cutting training to places in South Africa and Europe. Kirby Water Conditioning and Jansen Electric both service a 60-mile radius from DeWitt, offering their expertise to many communities. On the other hand, Grace Lutheran Camp and the Clinton County Fairgrounds literally keep themselves local; however, they service people from all over the region with their extensive community rental facilities. Giving back. Locally owned businesses build strong communities by supporting local causes. Evidence is in the long list of contributors at a local fundraiser. Title sponsors at a charity event. It’s visible at the Veterans Memorial, a collaboration of companies such as Holst Construction, Hansen Monuments, Jansen Electric and others, who brought their quality of work to a meaningful project. Rooted in DeWitt, these professional service companies provide us with the advantage of their expertise every day. Reliable problem-solvers with dependable service, highly trained and price competitive. Look Local First. It’s all here, right around the corner. This entry was posted in Community Insights, DeWitt Delivers, Look Local First and tagged Attorney, Custom Art and Sign, DCDC, DeWitt Chamber & Development Company, DeWitt Iowa, financial institutions, Grace Lutheran Camp, Hansen Monuments, Hasenmiller Spreadsheet Solutions, Holst Construction, Insurance, Jansen Electric, Kirby Water Conditioning, Look Local First, professional service, Touch of Bliss, Veterans Memorial on February 17, 2016 by admin.